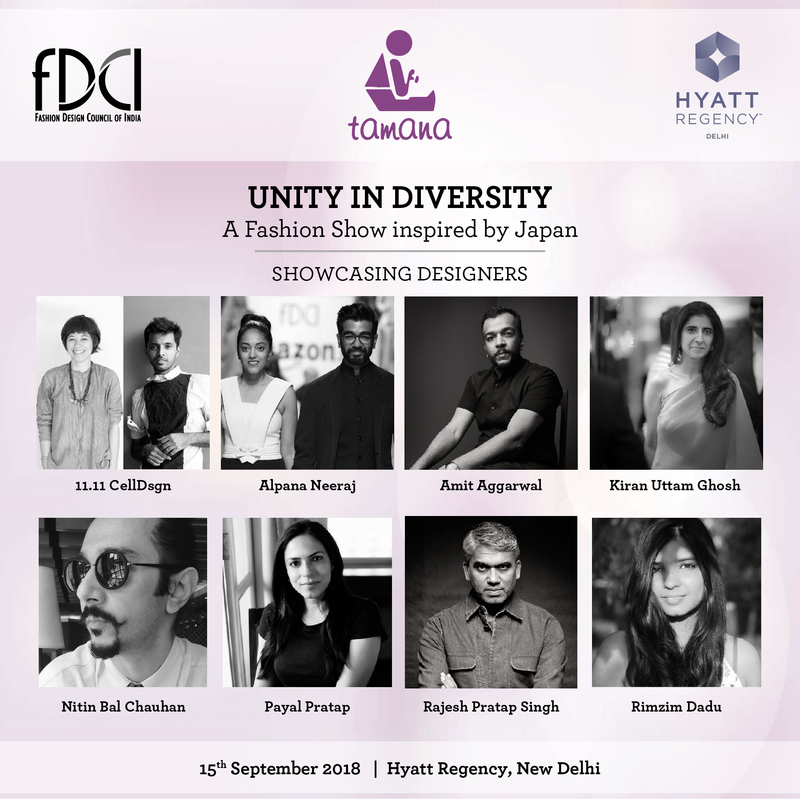 Tamana, a non-profit organisation, which is working for the holistic rehabilitation of the differently-abled, along with the Fashion Design Council of India (FDCI), will host its annual fashion show on September 15 titled “Unity in Diversity”. It reflects the acceptance for differences and unique abilities of every individual and ‘inclusion’ in society as an equal. The show is being held and co-hosted by the Hyatt Regency Delhi, which is Tamana’s CSR partner. H.E. Mr. Kenji Hiramatsu Ambassador of Japan will grace the occasion as the Chief Guest. H.E. Ms. Harinder Singh Sidhu, Australian High Commissioner, H.E. Ms. Joanna Kempkers High Commissioner of New Zealand will be the Guests of Honour among others. They will walk the ramp in saris designed at Tamana. The show draws inspiration from Japan, the land of the rising sun, and will see the differently-abled walk the ramp with dignitaries, leading designers, models, school principals and students. The participating designers include 11.11 CellDsgn, Alpana Neeraj, Amit Aggarwal, Kiran Uttam Ghosh, Nitin Bal Chauhan, Payal Pratap Singh, Rajesh Pratap Singh, Rimzim Dadu, Asha Gautam by Gautam Gupta and Asha Rani Gupta, Ridhi Arora and Namita Bansal. For over a decade, Tamana NGO led by its founder President, Padma Bhushan and Padma Shri Awardee Dr. Shayama Chona has been advocating the cause of the disabled and spreading awareness about the ‘Inclusion and Integration’ of the differently-abled through its annual fashion show. What makes this year’s event extra special is that for the first time the ensembles designed and manufactured by the differently-abled at the sublimation unit at Tamana’s Skill Development Centre will debut on the catwalk. The endeavour has received appreciation and recognition from the former Hon’ble Vice President of India Shri M. Hamid Ansari, Shri Narendra Modi, Hon’ble Prime Minister of India, Minister of Social Justice and Empowerment Shri Thaawarchand Gehlot, Minister of Rural Development, Panchayati Raj and Mines Shri Narendra Singh Tomar, Minister of Science & technology and Earth Sciences and Environment, Forest and Climate Change Dr. Harsh Vardhan. The evening starts with a live performance by Diwakar Sharma from the SaReGaMa Little Champsfame followed by a welcome dance by Tamana students dedicated to Japan. Mr. Sunil Sethi, President FDCI will give the welcome address and facilitate the chief guest along with Dr. Chona and Dr. Harsh Mahajan, Chairman Tamana. Following the facilitation will be the address by Ambassador Hiramatsu and a small award ceremony post which Dr. Chona will share a few words. The first fashion sequence, the Inclusion Walk, will witness Tamana students walk the ramp with the wife of the Japanese Ambassador of India, Australian High Commissioner to India, New Zealand High commissioner to India. This will be followed by the students walking the ramp in creations by Asha-Gautam, Ria Creations by Namita Bansal and Ridhi Arora with Principals and students from leading schools of the country. The participating schools include-----PP International School, DPS Aligarh, Lotus Valley International School, Noida, Lotus Valley International School, Gurgaon, Ambience Public School, DPS Gurgaon, Mussoorie International School, DPS Indirapuram and Amity International School, Saket. This will be followed by the fashion sequence by the participating FDCI designers and the show will close with Tamana Chona, brand ambassador Tamana walking the ramp and her thank you note. Tamana was established in 1984 by Dr. Shayama Chona, ‘Padam Bhushan’ and ‘Padam Shri’ awardee. As the name suggests, Tamana navigates the dreams and longings of the children with special needs and those of their parents to see them as rehabilitated members of our society. Its contribution in the field of disability was also recognized by the United Nations, that granted it Special Consultative Status with the Economic and Social Council. Tamana provides comprehensive rehabilitative services to individuals with intellectual impairments, multiple disability and autism. The services provided include special education, therapeutic interventions, skill development and gainful employment, life skills training etc to enable them to become confident and integrated members of society. The Fashion Design Council of India (FDCI), a not-for-profit organisation, is the apex body of fashion design in India and is represented by over 400 members. It was formulated topromote, nurture and represent the most incredible talents in the country in turn promoting the business of fashion, in India and globally. It organises one of the biggest trade event in Asia, the annual ready-to-wear, India Fashion Week (Autumn-Winter and Spring-Summer), and the yearly luxurious offering, the India Couture Week which has become a much awaited extravaganza by India’s top couturiers. However, besides being in the sphere of fashion, it has always been true to the soundtrack of the soul with its myriad CSR initiatives, which includes working with the NGO Tamana bringing to light the need to be socially aware. We hope these small steps make a big difference in the lives of billions and gives a voice to the silent. Hyatt Regency Delhi, India is situated in the commercial hub of New Delhi and is strategically located within 20 minutesdrive from Indira Gandhi International airport and domestic airport. The 507 rooms and suites of Hyatt Regency Delhi, India are equipped with modern amenities and high speed Internet access to support business needs. All seven floors of Hyatt Regency Delhi, India offer a panoramic view of the city and the landscaped gardens. Enjoy the dining and entertainment experience at award winning restaurants: Café – an all day dining restaurant, The China Kitchen, La Piazza, TK’S Oriental Grill and Polo Lounge. Revive at Club Olympus Spa offering various treatments. The hotel offers numerous leisure facilities on the premises including a fitness center and an outdoor swimming pool.